Most Americans eat way too much sugar. We average about 22 tsp a day (or around 150 lbs a year), even though the recommended daily allotment is just 6 tsp according to the World Health Organization (WHO). Sadly, they are the only organization who’s even put a stake in the ground about sugar intake. The USDA—who governs the recommended intakes for just about every other food stuff and nutrient—still hasn’t come out with a recommendation. Nowadays, we don’t have to use plain ol’ sugar. 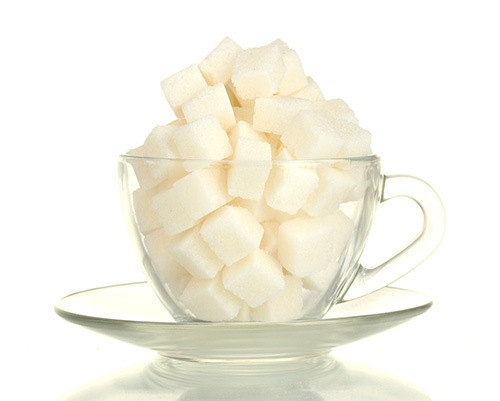 There are a lot of other sweeteners to choose from that won’t spike your blood sugar, and that actually have some health benefits and nutritional value along with sweetening power. This cheat sheet will help you understand the unique qualities of the more healthful options and how best to use them in cooking and baking. Stevia is a natural, non-nutritive sweetener extracted from the leaf of the stevia plant. Stevia doesn’t affect blood sugar levels at all. It’s ideal for diabetics. In addition, Stevia is calorie-free, but tastes up to 200 times sweeter than sugar. It’s available as a concentrated powder or liquid. For your healthiest option, be sure your Stevia is made from a pure extract of stevia rebaudiana plant and hasn’t been combined with fillers or other highly-processed ingredients. Because it’s so concentrated, Stevia works best in combination with other sweeteners, so you can lower the overall glycemic index without compromising texture or taste. Substitute 1 cup of sugar for 18 to 24 stevia sweetener packets, 1/3 to ½ teaspoon of undiluted stevia powder or 1 teaspoon of a liquid stevia extract. Choose the amount based on how sweet you wish your cake to be. Replace the lost bulk of the sugar. 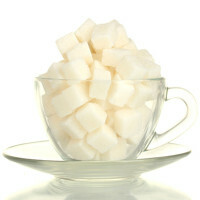 For each 1 cup of sugar substituted, use 1/3 cup of a bulking agent. Some options include: egg whites, apple sauce, fruit puree or yogurt. Water can also be used in some cases. If one of these bulking agents is already being used — such as a banana in a banana nut cake — simply increase the amount of that ingredient in the recipe. The batter should flow smoothly and be neither too liquid nor too chunky. I don’t recommend substituting all Stevia for sugar in recipes because it can dramatically change the texture of what you’re making … and not in a good way. This traditional Caribbean sweetener offers a fairly low glycemic index (around 35) in a granulated base that can easily replace traditional cane sugar in recipes. Coconut sugar also has a caramel flavor that enhances most baked goods. While most sources suggest replacing white sugar one-for-one with coconut sugar, keep in mind that coconut sugar is slightly less sweet, so you may want to add just a little more if you like things sweet. I actually don’t, so I end up using a bit less coconut sugar than the recipe calls for in white or brown sugar. Coconut sugar doesn’t dissolve as fully as cane sugar does, so be sure to mix with wet ingredients to allow it to dissolve before missing it into your recipe. You could also grind it first in a coffee grinder. This is my “go to” sweetener whenever I’m baking anything, like this banana zucchini coconut bread. Coconut nectar is derived from the same source as coconut sugar (the coconut palm tree). It’s a thick, sticky syrup that can replace honey, corn syrup, brown rice syrup or agave nectar one-for-one. It’s a bit stickier and thicker than agave or maple syrup, so you may need slightly more when substituting those with coconut nectar. The flavor is similar to coconut sugar, adding caramel or butterscotch tones to your recipe. This sweetener is derived from the roots of a tuberous plant found in and around the Andes Mountains. It’s often compared to molasses, although the flavor is not as sweet and is also slightly tangy. One benefit of yacon is that it contains natural sugars called fructooligasaccharides (FOS), which help feed the good bacteria in your gut. Use yacon in combination with other sweeteners, as it’s slightly piquant flavor on its own may be too powerful for your palate. Yacon works well with robust or strongly-flavored baked goods like chocolate, carob or spiced goods, like a spice cake. Lo Han Guo (called monkfruit in English) is derived from a melon-like fruit that is native to China. It’s similar to Stevia—considered a zero-calorie and zero glycemic natural sweetener. It doesn’t affect blood sugar levels either, so it’s a good option for diabetics. The pure extract can be up to 200 times sweeter than cane sugar, so a little goes a long way. When used in baking, you’ll need to adjust your recipe to accommodate the decreased amount of dry ingredients if you opt for Lo Han Guo instead of sugar. Not all stores carry these products. Stevia is probably the one you’re mostly like to find. But these are all just a click away on Amazon.com, which is one of my go to sites for ordering things I can’t find locally. Check out these other tips for making treats healthier. And get a list of 30 sugar substitutes for any and every possible situation.